The 5th AU-EU Summit, to take place in Abidjan, Côte D’Ivoire, on 29-30 November 2017, focuses on “Investing in Youth for a Sustainable Future”. 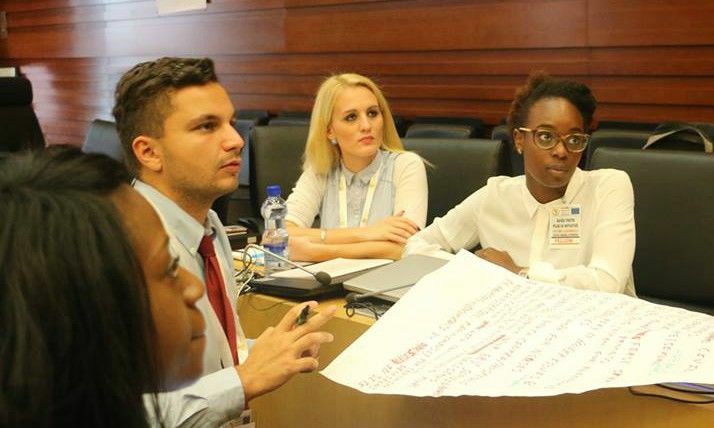 An initiative called “AU-EU Youth Plug-In Initiative” (YPII) supports 36 young people (“Youth Fellows”) in elaborating concrete proposals for European and African leaders. EURACTIV.com spoke to one of them. The 36 Youth Fellows have been selected from over 7,500 applicants, based on a series of criteria, with a focus on their expertise, proven results, networks and understanding of the six thematic cluster topics. The AU-EU Youth Plug-In Initiative is the first of its kind to encourage young influencers to find innovative solutions on six key topics impacting youth on both continents. The six key thematic topics have been raised as priorities by youth: Business, job creation and entrepreneurship, Culture, sports and arts, Eeducation and skills, Environmental preservation and climate change, Governance, political and democratic inclusion and activism, Peace and security. Teodor Kalpakchiev, from Bulgaria, is a member of YPII, the cluster for governance and political inclusion. In recent days he was in Addis Ababa and in Brussels in preparation for the AU-EU summit, together with the other 35 ‘Youth Fellows’. Kalpakchiev spoke to EURACTIV’s Senior Editor Georgi Gotev. #YPIIGovernance Meet Governance & Political Inclusion Cluster Member Mr.
Can you describe the initiative in your own words? Well, it is an innovative initiative that attempts to go beyond what has been attempted already with empowering the youth. What usually happened in the past was that the youth handed in a form of political declaration, which either serves as a starting point for the discussions, or is simply discarded if it deals with topics that are sensitive. But the African Union – European Union Plug-In is a completely new way to assure improvement in the follow-up. It is done for the first time and includes a strong input component, achieved through meetings with institutional, external, civil society stakeholders in Addis Ababa and Brussels and finally with the governmental leadership of both continents in Abidjan. The point is that the time is right, as the African Union is attempting to switch the focus on migration through seeing the demographic trend in Africa as a dividend that can accumulate growth, ideas, innovations. Hence, even though the younger people are often constrained to issues related to education or jobs, this time they are legitimate stakeholders and agenda setters. The whole point of this initiative is to feed the heads of state from beneath and within with critical, yet constructive ideas on how to move on further after the summit. How exactly is the initiative bound to the 5th African Union – European Union Summit in Abidjan? The AU-EU Plug-In Initiative is the follow-up of the Abidjan Declaration adopted by youth some two months before the 88 heads of state will meet in the very same place. It includes meetings with African Union officials, as well as participation in the input and output forum on jobs creation, then meetings with institutional stakeholders, experts and civil society and finally some two weeks of policy and project oriented output in each of the clusters mentioned. Their selection has been very much reflective of issue-driven pragmatism and attempts to discard the existing linear relationship between the two regional integration entities by fostering technical multi-level cooperation. The African and European institutions are thus both empowering the Plug-In fellows and expecting workable and innovative solutions to existing impasses, which are more or less related to the elaboration and implementation of existing commitments. Ultimately, the fellows are expected to deliver a comprehensive set of implementation modalities in front of the heads of state of both continents, as well as the institutional leadership of both unions. Tell us about your work in the Governance cluster? Within the governance cluster we have chosen to focus on three issues, which promise to have wider outreach and effect. Already during the adoption in Abidjan, we managed to push forward a proposal to revoke the disparity between passive and active political participation restrictions embedded, thus facilitating the political inclusion of the youth. As part of the Plug-In, we selected first and foremost to focus on anti-corruption (including targeting illicit financial flows, widening the tax base in the shadow economy, as well as restricting tax evasion) as a pathway towards generating own resources in Africa. We hope thus to enable the financial self-sustainability of the African Union, which would act as an empowering instrument and allow it act on equal terms with EU. An important point here is to mention that anti-corruption could be embedded into the wider concept of good governance, which also includes efforts to establish an accountable and inclusive system of governance. Instruments that can for example help us in that direction are e-Governance tools such as procurement registers, anonymous whistleblowing platforms, banking surveillance, as wells RFID labelling and tracking of goods. Another interesting approach could be to use the Circular Economy to generate own resources both through the taxation of waste, its reuse for other purposes, as well as improved tracking of natural resources. Last but not least, although budget support has been considered a vital means for enabling African ownership of the policy agenda, the disbursement of direct subsidies into the government account too often does not target the needs on the ground. Our second point deals with the inclusion of youth into policy-making processes that go beyond the usual constraints, such as working only on education, skills and jobs. The rejuvenation of the civil society sector does naturally put some pressure on the governments that do not govern well, yet their power holding and sharing agreements often leave little space for action. Initiatives such as this one are an innovative way of including that subject of any of the long-term agendas as a stakeholder. We have already discussed the prospects for the vertical inclusion of youth in the post-Cotonou process, as well as potentially establishing a direct link between the electorate and the pan-African parliament, which is interestingly in South Africa, part of the BRICS group. Our third main idea stems from the fact that all regional integration projects have multiple levels of governance, but all too often the focus remains on the broad political agendas that transcend traditional statehood and result in intergovernmental agreements with incoherent implementation. Hence, we decided to propose the expansion of the existing city networks in the EU and its vicinity further in Africa in order to foster the creation of relationships based on equal exchange, technical cooperation and good practices. That will be in lieu with the fact that implementation of sectoral priorities such as reducing the share of the informal and shadow economies, integrated planning for eco-innovation and competitiveness, as well as protecting global public goods work best on the local level. This also holds true for enabling political participation, combating organised crime through effective judiciary, driving result-driven education programmes that correspond to local realities or mobilising taxes through creating a resource efficient economy: this is best done on the local level. What is even more important is that the exponential demographic trends evident in the emerging world mean that many cities will be home to more citizens than countries themselves, hence solving issues related to, for example, resource mobilisation and ecological sustainability will be done first and foremost in cities. I hope this doesn’t sound too expert. We are young people, not exactly experts today. But probably experts some day soon.